Since his success at the Van Cliburn International Competition in the 1980s, Philippe Bianconi has made an international career, pursuing his musical itinerary and patiently carving out his path far from media hype. The release of his disc of Debussy's 'Pr�ludes' on La Dolce Volta was one of the recording events of the year 2012, winning a deluge of international distinctions and a nomination at the Victoires de la Musique Classique in the category 'Recording of the Year'. 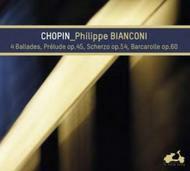 Bianconi's first Chopin disc features the Ballades, with an exploration of later Chopin in the Fourth Scherzo and the Barcarolle. Chopin's final years display an extraordinary evolution in his musical language, with a harmonic freedom and a refinement that looks far into the future. The enchanting sonorities and the density of Philippe Bianconi's interpretation make his new CD a major addition to the Ballades' discography, enhanced by the exceptional sound quality of the recording itself, to which the pianist has devoted particular attention. Philippe Bianconi studied at the Nice conservatoire with Simone Delbert-F�vrier and later with Gaby Casadesus in Paris and Vitalij Margulis in Freiburg. At the age of 17 he won first prize at the Jeunesses musicales competition in Belgrade. He went on to win first prize at the Cleveland International Piano Competition and, in 1985, the Silver Medal in the Van Cliburn Competition. Since his Carnegie Hall debut in 1987 he has performed in major concert halls and festivals around the world. Apart from solo recitals and chamber music, he has performed with many leading orchestras and conductors. The Washington Post has described him as an artist whose playing is "always close to the soul of the music, filling the space with poetry and life".